Kobikit puts you in the center of your work and help you get the control of your daily business. No more getting lost in email overload or document chaos! Kobikit provides hundreds of free apps to select and work with your employees, biz partners and clients. Let the collaboration help your company to become more productive and competitive. Change or even create any app according to your needs without any technical knowledge or requirement. Simply drag & drop your work! Engage through one familiar tool! Forget about tens of different tools, high cost tech guys! One tool to become a social business! 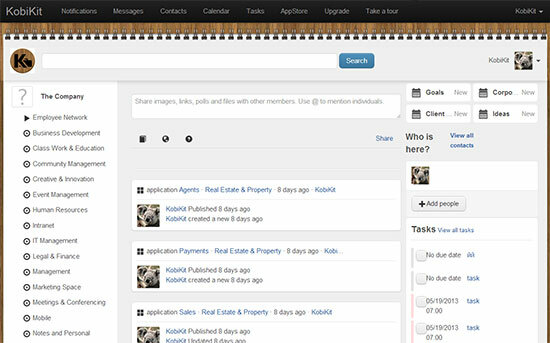 Kobikit.com is a web based (SaaS) platform for business teams to collaborate in a multiple workspaces, which helps small and medium sized businesses (SMB) attract and retain customers by enabling their team to work more effectively together inside and outside of the company ecosystem, and engage with their prospects and customers to create long term “relationships”. Kobikit is not only for your employees or co-workers - but also for clients, business partners, for whole ecosystem of your company. You can work with everyone on Kobikit: with your co-workers or with your clients in dedicated work spaces. 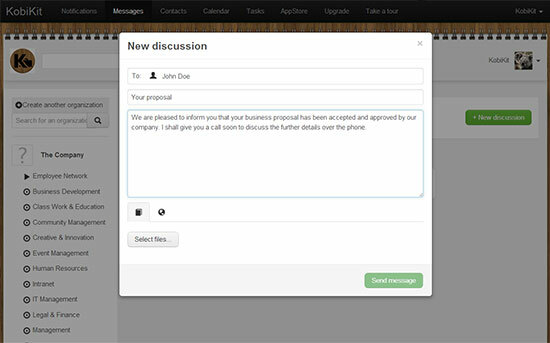 In your free Company Intranet your entire company can communicate, anyone with a company email-address can join. KobiKit Apps add structure to your work, with a social activity stream featuring comments, likes and status updates. Set/follow up with responsibilities, deadlines, tasks and content for a project team. Provide better coordination and alignment in your organisation. Instant, customised intranet without the long implementation process of traditional intranet software. Get rid of the chaos of emails, documents, and different tools. Enjoy productivity increase by just 'getting it done' in social, on mobile and in real time. Leverage your team's input for product development, bring your products faster to the market and enjoy customer feedback. Collaborate more efficiently on converting leads. Standardize high quality of information by allowing acces to others, share real time stats and progress of sales team. Collaborate more efficiently on converting leads together. A structured process that can be customized easily - works for HR, recruiters and agencies of all sizes. Get rid of spreadsheets and email junk and just focus of your resal purpose in real time. Online event planning with collaborative and quick decision making. Bring the perfect team together to manage any project or business process. Work with anyone from anywhere. The next level of task management. Kobikit adds business context to every task, saving you time. 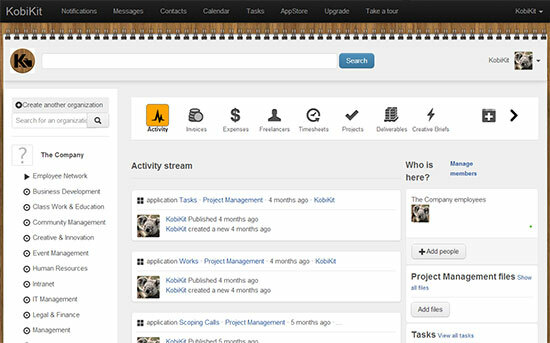 Hundreds of free work apps for handling projects, sales leads, product development, job candidates and more. Access and share content with integrations of every major file-sharing service. Stay in the loop with push notifications and private messaging, integrated with your phonebook.